I have to confess that I haven't heard of Vhäldemar before I got this re-release of their 2013 release. The Spanish quartet was founded in 1999 and this is their 4th album - and as far as I know all have been self-released. Now that they are signed to Fighter Records they re-issue it. 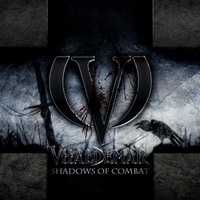 With drums they kick off Shadows Of Combat and head into Rock City, a riff-based rocker with powerful vocals by Carlos Escudero. The opener has a catchy vocal line, the lead guitar picks up the melody then presets a neo-classical part - before returning to the riff-based part. The song reminds me somehow of Accept... The sound of thunder opens up Black Thunder, an up-tempo neo-classical power metal track. The following tracks are mainly up-tempo ones and contain the same ingredients. A mid-tempo rocker is The Old Man with a sing along chorus. A metal anthem which reminds me of old Grave Digger, especially one line seems to be inspired by Rebellion (The Clans Are Marching). Spoken words lead you into the fast, guitar-driven Old King's Visions (Part IV). The outro Oblivion is a slow, acoustic piece which includes elements of flamenco. The bonus track King Of The Night was recorded during the recordings of their 2017 release Against All Kings. Fans of Accept, Grave Digger, Rebellion and Storm Warrior should check out the Spanish quartet!